Wow, has it been an increadibly busy weekend. Allen and I have been going non-stop since Saturday morning. I found out last week that the baby’s furniture had arrived at least four weeks earlier than we had expected. This is good in that we now have plenty of time in case we have to return any damaged items, but was bad in that there was still a ton of things we had planned to get done before there was furniture in his room. The two big things I wanted to get done was repainting his room and having our upstairs carpets cleaned. 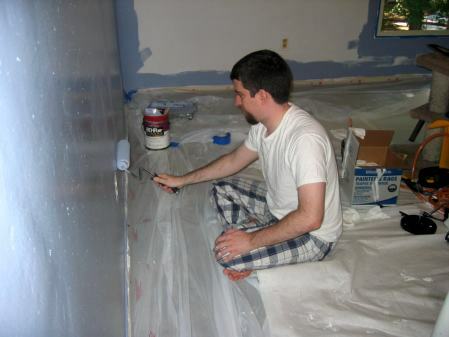 Thus, Allen busted his behind to paint the room this weekend so that I would only have to take one day off work for carpet cleaning and furniture delivery. Here are some pics of the room. I wish I had taken some before and a few more progress pictures. This room was the bedroom of the previous owner’s teenage daughter and was a mottled peach/orange/brownish color. Now it is a grey/blue. 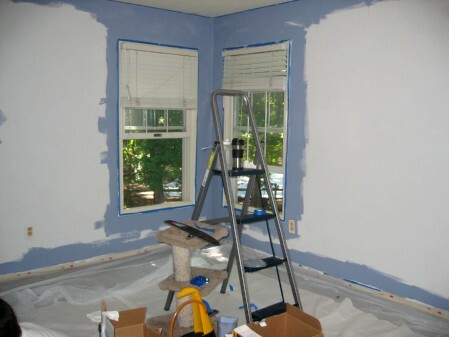 Here is the room after it had been primed and Allen started making his way around the edges. Here is a view of the finished room. The baby’s room is at the back corner of the house. He will have a lovely view of woods and the neighbor’s pool and basketball hoop. I just hope he can nap through the sound of the thud of basketballs on concrete. And here is the hardworking guy. While Allen was busy painting, I was busy trying to get all the rest of the upstairs ready for the carpet people to come. I think I made pretty good progress. Just the clean up in the baby’s room and the study to hit this week and a quick vacuum. 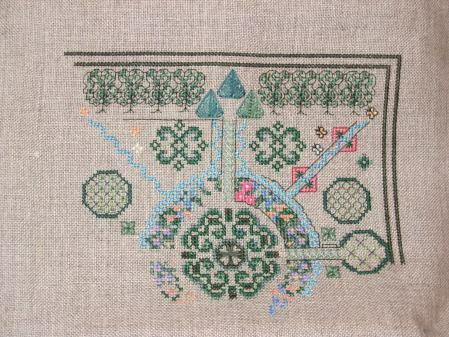 I also got in a couple hours stitching on LTDs German Garden. I am trying out a new rotation in the hopes of hitting all my WIPS and getting in some finishes. (If you are interested in seeing my rotation ideas, check out the tab at the top of the page) I would say I am at the 40% completed point on this piece. I really like stitching the circular bed on the left side this afternoon. Now it is back to RRs for a night or two. I hope to have Carol’s house done by Tuesday night by the latest and next weekend my goal is to stitch Winter Dragon on Outi’s Dragon RR as part of the Stitch-a-thon weekend. I would like to have both pieces ready to mail by the end of the month. Great to see the baby’s room all freshly painted. It will be such fun for the two of you to get it all decorated for your little one. I like the colour you chose for the baby’s room! Great progress on your garden, too! 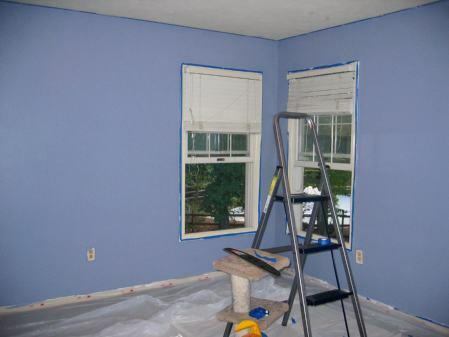 That’s a gorgeous blue for the baby’s room! How exciting for you to see it coming together!! The baby’s room is looking great, well done to Allan for getting that done! Sounds like life is quite busy in the run up to your baby’s arrival, I’m impressed that you’re able to find time for stitching – I feel sure I’d be collapsed in a heap somewhere! Well done! Congrats on the room – it’s really going to be fantastic! Can’t wait to see more. Great progress on your garden too – pretty! I can completely sympathise with you about the babies room. We had to paint our daughter’s room, but found we had repairs to be done on the walls first and then we had to have all new carpet installed. This was all completed with about four weeks to go. It was lucky that she arrived two weeks late otherwise we may not have made it in time. By the way, the German garden looks great. Can’t wait to see it finished. Your baby”s room looks great! Your wip is lovely too. It seems your baby is going to have a beautiful room to sleep in !!! Congratulation on your progress!!! It will be fun for you setting all of the babies things up, his room looks great. ohh what a pretty blue!!!!! I love the new room paint! I love LTDs, I’ve just never had the courage to try one myself though! Your garden is so pretty!!! Hi, I love the color of your baby’s room. Would you happen to remeber what paint (brand, type etc) you used? I’m expecting now and this is the exact color I’d like our baby’s room to be. Thanks a lot, A.